Think your wife nailed it with the spider bite. Look for signs of infection. I once got a horrible infection from a spider bite. Eventually got smart and took the mess to a doc who said it was dangerously close to destroying flesh. He lanced it and the problem went away pdq. I'll start with wishing you comfort and healing brother, Heirloom. And then say thank you for the Cool info on the molecular sieves. I've only read about them in passing, and know very little about them. Thanks pharmer , I was careless and now am more afraid of spiders than ever. My wife has been bitching about them for years. I have had the ulcer from bites before. My neighbors wonder why I have so many spider webs,birds and other living things in my yard. I don't kill them off , use no poisons in my mini forest yard, I'm seeking a natural balance with nature. Thanks juthro , I am healing , I guess the still will provide medicine as granny from the Beverly Hill Billies made on occasion. I am healing up, swelling is down, still numb hand & arm though. I believe the venom affected my mind but would not recommend trying it, could of been the steroids given for treatment. I haven't had a good nights sleep in a week. 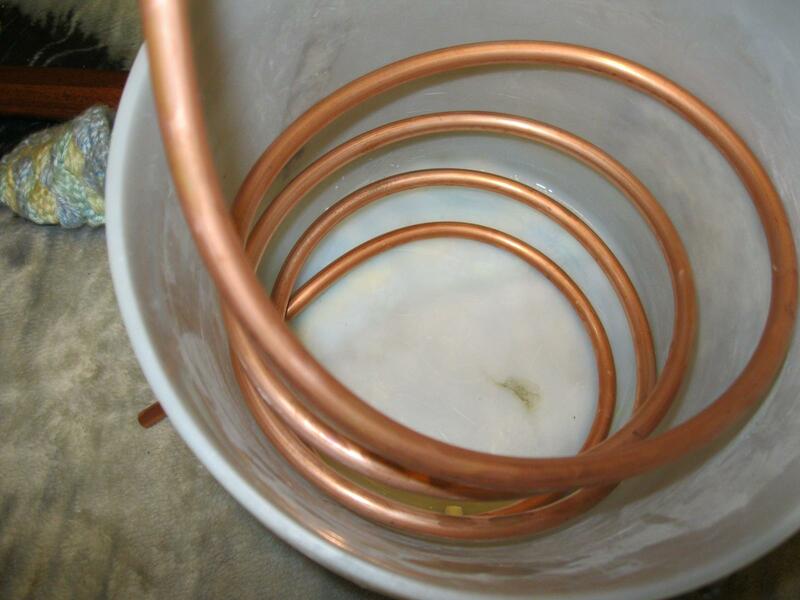 I'm getting ready to put my still together a 3 gallon stainless steel pot a 10 foot copper worm in a bucket. I'll use this to learn on until I save up enough to buy a 7 gallon stainless steel still from Brewhaus. 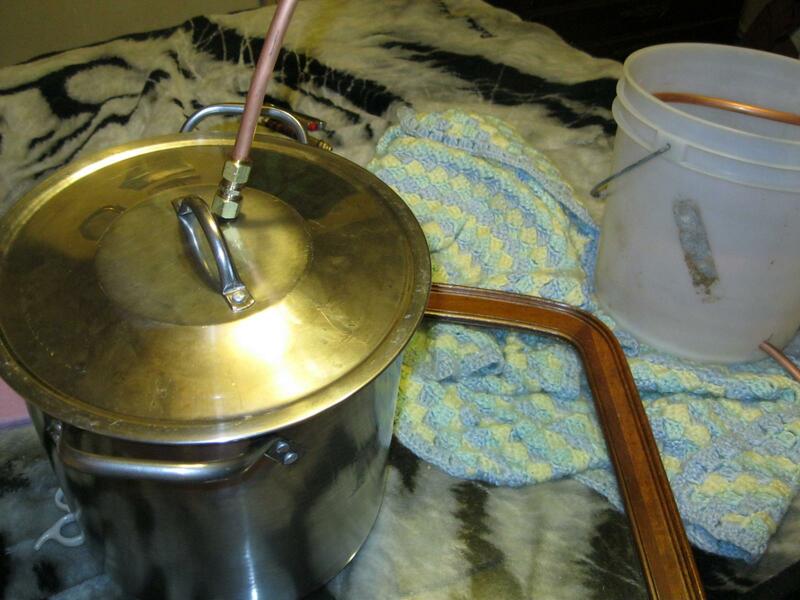 I will do a first run soon ( a few days ) and show alcohol content with pix, of course I will show the still, using electric heat for safety. The total amount from my first 5gallons of wine distilled & ABV. This is a learning experience I know I will not do as good as those with experience. "most common stainless steels are 'austenitic' - these have a higher chromium content and nickel is also added. It is the nickel which modifies the physical structure of the steel and makes it non-magnetic." "Stainless steels are a very broad group of metals. The name was adopted as a generic term for steel alloys with a minimum of 10.5% chromium. The chromium gives the steel its 'stainless' properties - essentially corrosion resistance. On the surface of the metal, a very thin chromium-rich oxide layer is formed which is inert - i.e. it prevents the steel from rusting. The advantage of stainless steels over plated steels is that, if scratched or damaged, the steel will 'self-repair' as a new oxide layer is formed. In plated steels, scratches in the plate will often lead to corrosion of the steel underneath. Stainless steel in general, the higher the proportion of chromium, the stronger the corrosion resistance of the steel. In addition to chromium, other metals are added to give the steel particular properties such as strength and malleability. Specifically nickel is used to strengthen the oxide layer. As for whether they are magnetic, the answer is that it depends. There are several families of stainless steels with different physical properties. 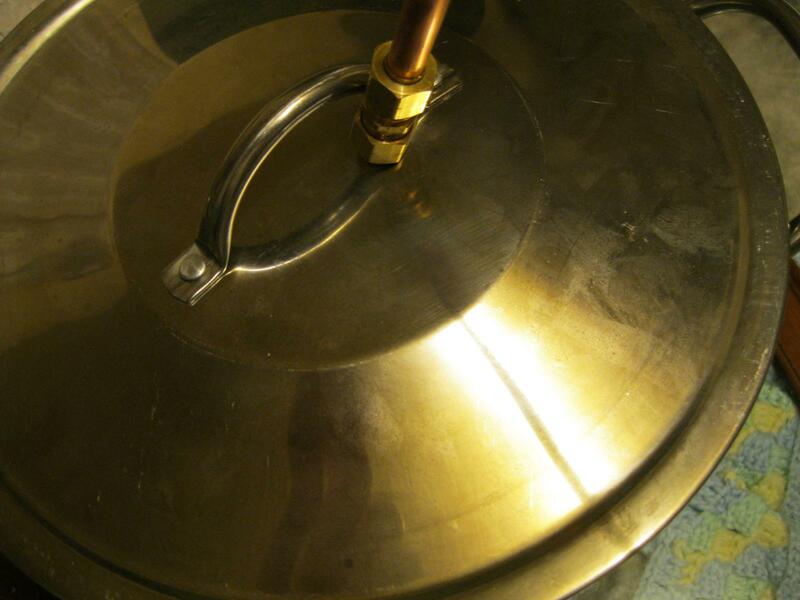 A basic stainless steel has a 'ferritic' structure and is magnetic. These are formed from the addition of chromium and can be hardened through the addition of carbon (making them 'martensitic') and are often used in cutlery. However, the most common stainless steels are 'austenitic' - these have a higher chromium content and nickel is also added. It is the nickel which modifies the physical structure of the steel and makes it non-magnetic. Edited by Heirloom , 29 September 2017 - 01:48 PM. Glad your doing a little better Heirloom. Where I used to live in Oregon, we had lots of spiders. While most are pretty harmless, we did have hobo spiders around. Their venom is one of the nasty ones that causes ulcers and tissue death. My brothers boy got a bite on the back of his shoulder from putting on a shirt that had a spider in it. Once trapped between the shirt and skin the spider bit him. The wound was nasty. The doctor said that hobo's venom is so poisonous that your body's reaction is to clamp down hard all of the capillaries around the wound as a way to keep the poison from spreading. The down side to that is the flesh around the wound no longer gets blood flow and dies. The wound must be kept very clean to prevent infection or gang green from growing in the dead tissue. Anyway, enough horror stories :) I look forward to seeing what you get going my friend. Edited by Heirloom , 02 October 2017 - 06:34 PM. My sugar ( w/lemon juice added) wine tested at a little over 5%, I tasted it and was ok, I even got a little buzz from a few pints. I was pleasantly surprised with the results.I can se myself brewing or vinting in the near future. I hope this breaks this streak of bad luck I have been having. pharmer thanks for pointing that out - ethanol is not a lacquer thinner, my excuse ignorance, I needed to know that. I don't even know what lacquer is, I have led a sheltered life, where I lack common knowledge. ok I have come to the conclusion that a still is the best way for high quality alcohol. With my 5% ABV wine it would require 950 grams of anhydrous magnesium sulfate per liter to produce 50 ml of 99%ethanol in theory . Not very efficient and labor /energy intensive/ costly. I will get back with the results of my first distillation attempt. I want to be able to justify the cost of a still. I was fairly sure ethanol would not thin lacquer but didn't check it out to verify. I think lacquer, at least recently, is a synthetic construct and would most likely be made of modern solvents. The Japanese were doing "lacquering'" techniques on their furniture a thousand years ago. My curiosity is up now and if there's anything worth sharing I'll get back here with the findings. Edited by pharmer, 08 October 2017 - 07:38 PM. I have been drinking my own and realized I made a mistake . to extract 1 ml/gm of water requires 0.5gm of anhydrous magnesium sulfate. The short version is I only need 450grams of AMgS to absorb 950ml/gm of water. Edited by Heirloom , 08 October 2017 - 07:33 PM. .5 mg X 950 = 475, not sure if the extra 25 matters, but that is the math. I know your old enough to know this already, and I am in no position (and I'm trying not to) to preach. I just want you to stay safe, and be well my friend. It is a personal weakness of mine, and I have to make a conscious effort not to be careless. For my good, as well as the good of those I care about. Edited by Juthro, 09 October 2017 - 01:43 AM. So Heirloom, were you just using sugar with your turbo yeast, or did you have some other fermentable? If you don't mind me asking. Are you following directions on the turbo yeast package? Edited by Juthro, 11 October 2017 - 02:45 PM. 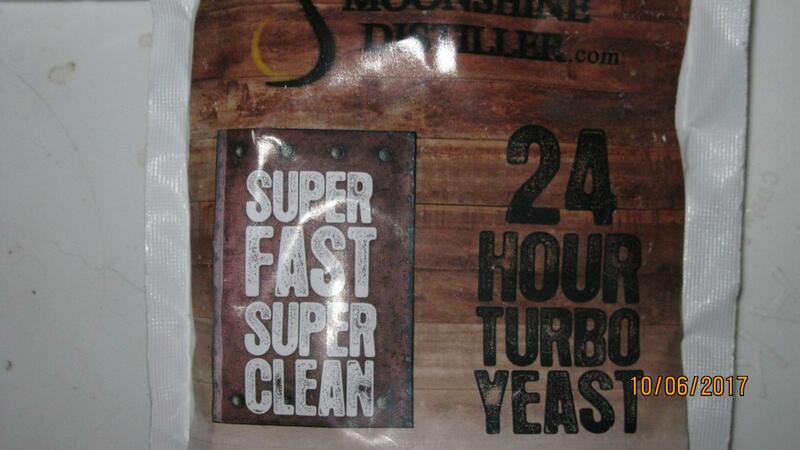 I haven't tried the turbo yeast yet . I used 4 lbs of sugar a pack of montrech and 5 table spoons of lemon juice , I just woke up from a nap after drinking several measuring cups full. Welll sheeeeeeiiiitt! I've spent a couple 4 hour sessions on youtube studying distilling. I'm embarrassed at my self for knowing so little about something so do-able. Ethanol is slightly harder but certainly within reach. Maybe we should change the title of this thread to “Evolution of ethanol”?